The Hôtel Belvédère was once a Grand Hotel catering to well-heeled travelers bound for Spain and obliged to wait several days while their visas were being processed. To make these ‘sleepings’, as the stopovers were called, as pleasant as possible the hotel’s amenities included a chambermaid for each of thirty guest suites, movie theatre (a poster for Le Masque de Fu-Manchu starring Boris Karloff and Myrna Loy remains), rooftop tennis court and a dormitory for travelling domestics. On the downside, toilets and showers were shared. The Le Belvédère du Rayon Vert, to use its full name (a nod to Verne or Rimbaud perhaps), was the brainchild of Jean de Léon, owner of the station buffet, which gives an idea of the sort of business he was pulling in; Cerbère must have been quite the busy town back then. The architect was one Léon Baille, of whose oeuvre we know little beyond this striking little period masterpiece formally inspired in contemporary naval architecture and wedged into a tiny plot between the railway and the sea. The doors opened in 1932, one can imagine with much hoopla, but the timing could hardly have been less fortunate. Four years later, Franco launched his Crusade against the Republic. Civil war was followed by autarchy, and the Spanish tourist industry effectively lay dormant for another couple of decades, by which time travelers’ demands had much changed. Still the hotel struggled on, finally closing its doors in 1983. 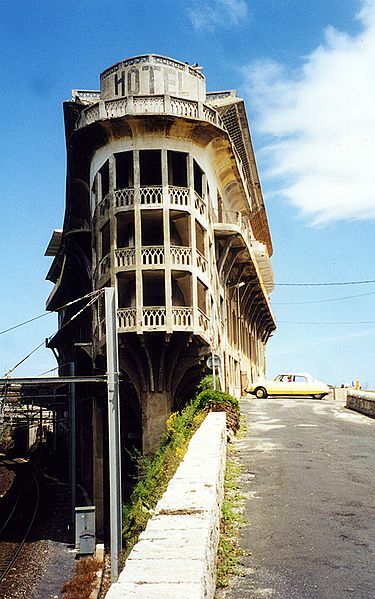 The building has remained in the family to this day and is now listed as a monument historique. Now offering eight holiday apartments, all with sea views, as well as a unique glimpse of Art Deco history, Hôtel le Belvédère is once again opening its grand doors to the public. With annual film festival in October and various private events, the restored ball room, dining room and performance stage are once again coming to life. Watch out for exhibitions, festive suppers, theatre and concerts in the future in this historic venue.